Many divers question the need for a snorkel when, as a diver, you have a regulator. The truth is that in many places, snorkels are mandatory equipment for recreational diving. Not only does a snorkel allow you to save air and energy whilst on the surface, but, they are an excellent piece of safety equipment for those surfacing a long way from their exit point. There is a vast range of snorkels on the market to choose from ranging from the simple old school J types to more complex models with dry tops, purge valves and even FM radios! In my experience, go for something simple, models with moving parts are more likely to go wrong. However, I would recommend a purge valve snorkel for ease of clearing water. Ensure the purge valve is covered with some sort of protective case to protect this fragile component. Some snorkels may be marketed as either “high volume” or “streamlined”. In either case, I would generally recommend avoiding such types at either end of the spectrum. High volume snorkels, once full of water, are often simply too difficult to clear, whilst streamlined snorkels may prove too difficult to breathe through. To gauge the ideal length for a snorkel, when attached to the mask and in position, the top should sit approximately 5cm above the top of your head in order to minimise the amount of dead air space. As you may get excited when snorkelling and often bite off the mouthpiece parts, choose a snorkel that has a replaceable mouthpiece. The mouthpiece should be soft and comfortable when worn and as with mask skirts be made of 100% silicone which is both hygienic and comfortable and will not perish over time. A snorkel should be flexible so that if you accidentally knock into something when diving it will bend and flex taking the impact rather than pushing your mask off your face. Flexible snorkels have the added advantage of being more robust when dropped or a tank falls on them rather than the hard plastic versions, which will crack and break. 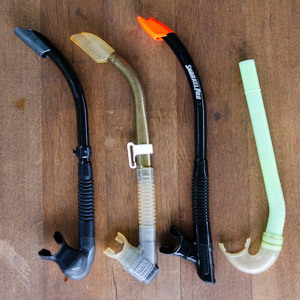 A flexible snorkel may also be more easily placed in a BCD pocket for those who dislike having a snorkel attached to their mask. To test flexibility, bend the snorkel in half, if it springs back to its original shape quickly, it is the right quality. 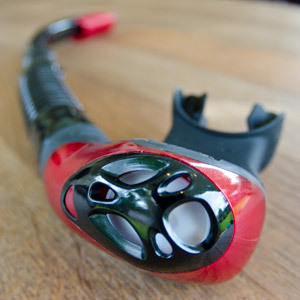 A further advantage of a flexible snorkel is that it allows easy packing for travelling. I often bend my snorkel and cram into a shoe when travelling!